in your home, or even in a housing project? For a professional design with individual character, you’ve come to the right people at Complheat Heating & Plumbing. We will base our work on your ideas and provide full support for you through our range of services. Whatever design you request, our professional team will support you for all of your heating needs. 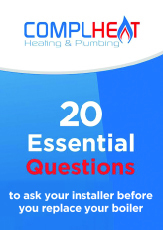 Complheat Heating & Plumbing can provide a free, no obligation quotation service and all work carries a minimum two year workmanship guarantee, along with any manufacturers’ guarantees, which can be up to ten years. Being without hot water or heating, is inconvenient and uncomfortable. At Complheat Heating & Plumbing we are equipped to provide an expert boiler replacement service and can recommend more efficient new boilers at competitive prices. Remove built up residue, sludge and deposits from a central heating system. Complheat Heating & Plumbing can restore your heating system to its optimum efficiency and reduce excessive workload on your boiler. Ideal for open-plan homes, wet rooms, bathrooms and kitchens, underfloor heating has become a viable heating solution for most homes and most floor types. Complheat Heating & Plumbing will visit you in your home for a consultation. Complheat Heating & Plumbing has years of experience in the maintenance and overhaul of boilers, radiators, central heating systems and gas fitting – we won’t replace if it can be repaired – that’s a promise and a guarantee.